It's 1 May of this year and Tianna Bartoletta wakes in her home in the leafy suburbs of Tampa at 6am flat, as the housekeeper is due to arrive in a couple of hours. The bed is empty as her husband has already gone to work, and that leaves her alone with the demons screaming in her head. She tells herself that she loves him, but that she must love herself too, and that she deserves better via a future and a life that won't hurt and rip her apart at the seams. No more conversing for too much talk and it loses its purpose yet, still, those demons don't stop and for each question they answer right on back. They always do as she's been here before, over and over, and the result has forever been the same. Words have meanings but actions have consequences, don't they? So, will she or won't she? Tianna Madison first bumped into John Bartoletta in an Orlando restaurant back in 2011. She was only 25 but was already a washed-up world long jump champion having taken the title in Helsinki in 2005. Turns out it's not always better to burn out as fading away would have meant many more years near the top, and the doors that the title opened wouldn't have been slammed shut so quickly. As for him, he was a 49-year old investment banker and together they talked for over three hours. He told her what she wanted and needed to hear. A year on they were married and all seemed well. John coaxed and convinced Tianna to get back to athletics but she was out of shape to the point she was anemic and ended up drinking 11 cases with 24 large bottles of water in each in the lead up to the London Olympic trials. "I was trying to transition into being a student full time, I was studying molecular microbiology, I had this whole plan," she says. "I wanted to apply for medical school after I got my degree so I was just using track and field to make a little money. But meeting him, he asked me to consider a return, he gave me encouragement, the small bit I needed to give it one last shot. And that's what I thought it was, I'd give it one last shot and then execute my transition plan." Not for the first time, she thought wrong. 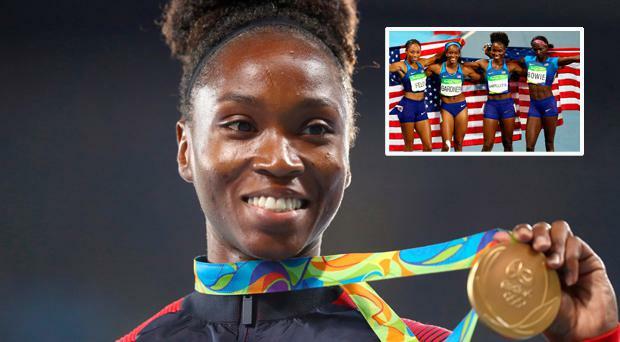 Within a few months she was the number one indoor long jumper in the world and made the United States 4x100m relay team for those 2012 Games, running the first leg of a gold-winning world record time. Having been in a corner shop before that race she even followed up on a promise to the cashier to bring the medal in after success, and she bought an ice cream and her new husband watched Harry Potter as a celebration. One person's fairy-tale is another person's nightmare. "A fraud," she recalls of herself around then. "To everyone. I wasn't myself. My personality was fabricated for the public and to keep peace at home. I was even shut off to myself. I ended up as the brakewoman in a United States bobsled by the end of that year. You know the reason? "Because I wanted nothing more to do with track and field. From the outside looking in I'd this Cinderella year yet for me I never wanted to do it again. I was just done. It was so hard. I guess I didn't expect what success would do to the dynamics of my relationship. But athletics went well and suddenly it was, 'Don't talk to the media,' 'Don't do social media'. All of this extra stuff and control that I didn't bargain for and wasn't expecting. So it was not fun for me. I guess in a sense the saving grace was that physics does not care if you're having a good time or having your worst day, if you are running properly and executing you'll get the results you want which is both a blessing and a curse. "With every medal and performance I turned in I felt like the truth would be less believable. That's the curse part. That if you ever spoke the truth people would ask how could I compete so well, that I must have been making up how bad life really was." What was that truth, you wonder? "That I was miserable," Bartoletta replies. "That I felt worthless, that I was nothing, and had nothing outside of the sport and would return to nothing when it was over." What made her miserable, you wonder? "I have to be careful because I don't want to paint myself into a box where I can be sued for this," she replies. "So, just, I'd just say it was a volatile situation, unpredictable. I wasn't sure what was going to happen day in and day out." The child star growing up in Ohio, the local archives are full of stories of her triumphs all along the road. She was the golden girl with the glorious life. On Elyria High School's High and Distinguished Honor Roll four years on the bounce. Gatorade Ohio High School Girls Track and Field Athlete of the Year. All-USA High School Girls Track Team. An appearance in Sport Illustrated so early. But then after London 2012 she spoke coldly about how she was molested by another student in her school. "It wasn't the first time I said it though, it was just the first time people were listening because I was an Olympian. I don't quite remember what the overall reaction was because my life was way less amplified then. "I went to therapy obviously, a psychologist for years for that, to come to terms with what it meant and how it would affect me moving forward. I know who they are, I don't know where they are, and I feel no need to confront to them. I don't carry any scar tissue with me." Your parents said they never knew before 2012 though, you tell her. "I don't know if answering that question will get me in further trouble so I'm just going to not answer that question." She made broken look beautiful, and strong look invincible. She walked with the universe on her shoulders, and made it look like a pair of wings. Back in spring, Bartoletta picked up the phone and dialed a number she thought had been lost to her. For most it would've been a first resort in the good times, for her it was a last resort in the worst times. "I needed my parents' help and they were willing but there is still a lot that needs to be healed between us that has nothing to do with my current situation. The relationship with them was damaged before marriage and just exploited by the dynamics of my marriage. There's a lot more to do but I guess that was a first step." When it started to fracture is hard to put a pin in such is the fluid nature of deterioration. When it completely disintegrated though was shortly after her 2012 Olympic victory when her parents sued both her and her husband. But it is complicated, as you'd expect with such matters, however here goes. They said that John had told them earlier that year that he and Tianna were planning to sue them for mismanaging her finances and abusing their power of attorney. While that case was never filed, her parents added that John Bartoletta also hired a bodyguard to protect his wife and they later accused their daughter of trying to sell a story and that Tianna had even text them saying that after the Games she would "break the story of your selfish, controlling and utterly abusive ways and treatment". The text added "it was going to be brutal". Eventually it was settled out of court but it made reaching out to them so hard. Desperate times and all of that. As for her own personal collapse into lost misery, the sport that made her look so strong and immovable had stripped away at her. She hated what people thought she loved. "I stopped doing the things that made me great in the beginning and when I was finally reminded of what it took, I gave too much credit for my successes to others so I never owned them. I never felt like it was me behind them, they belonged to someone else in my head and that just wasn't true. It was a lie I chose to believe over the last few years because, if it were me, why was I so bad in my life? "It was all just me withering away. I lost my personality, a stranger to myself. I didn't trust myself to make the right decisions. It felt like I was just getting broken down and I couldn't take much more of the negativity. As athletes we love to say that is what we are but it's true, it's a lifestyle. For me everything that I felt was breaking me down away from the track, I found a way to channel all that frustration and use it to make great performances on it." Turned out that behind the mask, survival was the real talent. How little we knew. Take just a year ago for example. Rio De Janeiro. A long jump gold making it two there, after being part of another top-of-the-podium relay effort. We looked on green eyed, she looked out teary eyed. Her memories of going back to the hotel aren't even fresh but she does remember her first thoughts having landed a personal best of 7.17 in the pit in round five. It wasn't that this was the greatest moment imaginable, instead it was that if she released her eBook people might buy it. Called 'Why You're Not A Track Star', she'd spent three years working on it, looking at the five major reasons the title explains. But there was no sign of it in the days and months after Brazil. "I didn't have a lot of support. I wasn't encouraged, let me put it that way. But those Olympics, John definitely wanted me to win. I was performing in a way to avoid disappointing people rather than performing and enjoying the competition. It meant so little, it was more like it was about just surviving." She came, she saw but she'd yet to conquer herself. "I became quite self destructive," she adds. "Alcohol, prescriptions, that kind of thing. It felt like it was too big a mountain to climb." Indeed in the last year walking off a train platform and taking her own life crossed her mind. "I felt that I had no way out of the feelings of frustration and shame." Frustrating and shame are interesting words, what were you ashamed of, you ask? "That's part of the place the shame keeps coming from. The reason you don't say anything is most people are so taken aback when you say it. They go, 'What are you talking about, you can power clean 100 kilos, you're an Olympic champion, you're a world record holder, how did you allow this?' And the reaction you get from some people, you internalise that. How did this happen? I'm supposed to be strong, right? I train six days a week, I push my body to the limits, and I am subjecting myself to this? It doesn't make sense on one hand. And that's where the shame is from. I also knew it wasn't normal. I knew it wasn't the best thing but I allowed it to continue." Here we are. Will she or won't she? It's 1 May and Bartoletta has finished pottering around the house. She does a final walk through, seeing what she needs for the next chapter and kisses her two dogs goodbye. Emotional, she scribbles down a note saying where the car can be picked up, grabs her three Olympic gold medals and drives them to a storage locker where they still reside. Then she hits the airport. "That was it. Gone. For good." In the end she had enough. Of the demons. Of her life. Of how people perceived her and how they'd respond to her honesty. The old saying says fear has two meanings - forget everything and run or face everything and rise; then again she'd tired of listening to others and of their advice. Where did she go? She'd rather not say but notes: "I had friends who knew the struggle I was having, with shutting down and drinking when I was overwhelmed. I didn't have any access to those things, it was like checking into a mobile rehab and they forced me to talk which I wasn't used to. But once I decided to leave, my self-esteem and pride in myself began to increase and I'd see in the mirror someone I was proud of, someone I didn't want to destroy. I was proving to myself I was worth saving because I was still fighting, in the metaphorical sense." Just 103 days later a post went up on her Instagram and it's worth digesting the lot. I knew defending my title would be difficult. And you may find it hard to believe but this bronze medal is THE most special medal I have ever won. Because just three short months ago I had to run away from my own home, I had to decide which of ALL my belongings were the most important, I had to leave my dogs, I had no money, I still have no actual address, all to give myself a chance at having a life and the love I deserved - one that didn't involve fear or fighting, threats and abuse. To stand on the podium after not even being in the mix for four rounds means the world to me. I took a huge gamble blowing my life up in such a important year for me career-wise. But it was about time for me to see that I was worth it. It was worth it. Thank so much for riding with me. That came about after her most recent visit to London for the World Championships in August as a final-round jump earned her third place and perhaps the sporting story of 2017. She took to the podium but few understood what her latest tears were made up of. Afterwards there was no visiting a corner shop, no ice cream, no Harry Potter, but there was something much more. "Part of me wasn't sure of what was true and what wasn't about myself. So to pull it together and get on the podium, I showed myself what is true about me and that is that I know how to be a champion in any situation. I know how to compete. I know how to show up. I had proved all those voices in my head wrong. There was relief, there was pride, there was also grief and mourning for the things I left behind. It was a release of all of the things I wouldn't let myself feel in order to give myself a chance to compete well. "And that night, I was a little bit like a zombie but I remember taking my medal out of the bag and turning it around and looking at my name engraved on the back and seeing there was no baggage attached to that medal. Not like the others. This medal was all me, done my way, and when I look at it I just see pride as opposed to the other memories I have surrounding my other supposed victories. "Being London, I had walked that line of not reminiscing because of the location but when the competition was over I think that played into the emotion. But it also meant I had come full circle." So what now? While there can be a familiarity in misery, that goes when you tread into such an unknown and this new world is one where she's only getting to know herself. Recently she even asked her coach what happens next - will she go into competitions light and free or does she lose the drive and disappear? "That's the scary part," she says. "Those are the questions I ask myself. That was part of my calculation, as crazy as it sounds, when leaving because it was a huge risk." But if athletics defined her and pigeon holed her into a life she never wanted, now she has options. She says she'll be around for Tokyo 2020 for sure but in the meantime she wants to work with younger athletes, do something with her real estate licence, live a little in a way that she dictates. And there's her book to push as well as 'Why You're Not A Track Star' finally came out, and with little promotion she chirps that it quickly got 1,000 downloads and she got a tonne of emails looking for advice. Noting that the surname of the author is still Tianna Bartoletta rather than her maiden Madison, as a last query you ask her what's in a name. "I was asked if I was going back to my maiden name and said no," she smiles. "I no longer attach so much meaning to names now I've been through all this so it's not something I need to dump. And I don't regret meeting him or any of that, it's another part of my life story. I've learned a tremendous amount of lessons. It reminds me of what it took, of what I'd lost sight of. It reminds me of who I was and what I went through and the lessons that I had to learn." Like, for instance, that every 60 seconds you spend upset is a minute of happiness you never get back. Ewan MacKenna: Why protect certain species when almost the entire ecosystem is endangered?